I am a big believer in play – and learning through play. Play is what children are on this planet to do. Play is their mode of communication, how they explore the world around them. It’s vital to their growth and development, and the nurturing of problem solving, fine and gross motor skills, not to mention emotional exploration. And quite frankly, there is nothing more gratifying for both adult and child than having a child immersed in play (especially if it gives us parents a little break!). Let’s explore 5 reasons play is so much more than “just playing”. Kids are constantly trying to figure out what is happening out there in the world and why. They are driven by their curiosity, and often the best way of figuring out some of the mind boggling things they have seen in real life is to sit down and play it out. Think about – why are out kids to fascinated by rubbish trucks, diggers and ambulances? They are these incredible monsters which do WHAT?! Yes, that is exactly what our kids are trying to figure out. Getting down on the floor and being able to act out what they are seeing in the outside world helps them make sense of the puzzlement of it all. When it comes to figuring out the world, WOW Toys are an absolute winner. 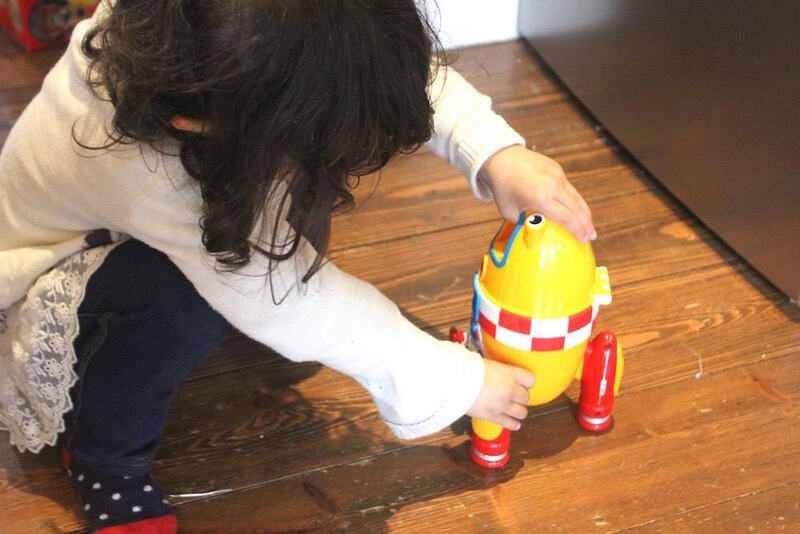 I have never seen my little one so preoccupied with a toy for hours on end – and indeed days on end, than with WOW Toy’s Flip ‘n’ Tip Fred which allowed her to play rubbish truck collection day on loop. 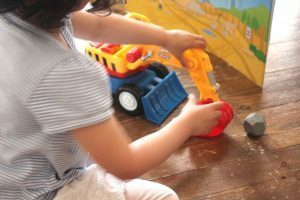 Complete with friction powered motor, various levers and flips to dunk the bins into the truck and other parts to move, slide and tinker with, this is a toy which give serious bang for your buck in terms of play. We may wonder why our kid wants to run around the table for the bajillionth time playing rockets but this is because sometimes they just need to let it all go, on repeat. Kids have a huge amount of energy and SO much going on in their heads, and hands down, every single time – play is the best way of letting some of that out before they explode. Playing emergency! with WOW Toy’s Robin’s Medical Rescue is the perfect toy to let off steam if ever there was one. 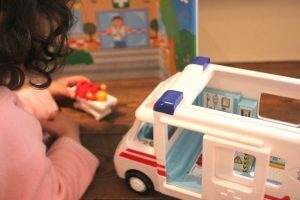 My sproglet spent a good hour or so playing paramedic racing the ambulance to various “emergency scenes” we set up around the room involving various other WOW Toys and people, getting them up the ramp on the wheelchair or in on a stretcher to then discover brilliant little touches like an x-ray machine inside. And of course, another great outlet was Ronnie Rocket which had her blasting off and zooming around on space missions until Major Tom couldn’t take it anymore! Play has intellectual and cognitive benefits for the brain and it is even believed that play can in fact shape the structural development of the brain. So here’s the clincher – while toys are great for helping this along – not all toys are equal when it comes to this, and one of my favourite toy brands WOW Toys absolutely know this. You just know they have spent a lot of time watching children play with their toys to understand play patterns and development, and how they stimulate learning. 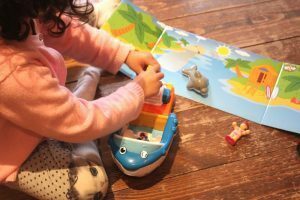 The difference in every single WOW Toy is the small exciting features and mechanisms which have your little ones enthralled for far longer than any other toys we have ever had in our house have. Let’s face it, having to teach out children what is right from wrong in words is pretty boring for both of you. However, if you can do it through play – it is a far more engaging way of doing so, and is far more likely to stick. Though interactive role-play, play provides the the stage for learning patience, how to take turns, consideration, empathy and so much more. Danny’s Diving Adventure not only gave us hours of fun both on dry land and in the bath but it also gave plenty of opportunities for social learning (read: taking turns!) with it’s nifty working diving board and dolphin to swim with. Although we may be tired, have a headache, had a hellish day at work, or simply not be in the mood, play is the primary way our kids choose to connect and build a relationship with us. They form secure attachments to us (and other people) through play, and this bond is the rock which enables them to have the self-esteem to go on learn and be happy. With play – and learning through play – being such an integral part of a child’s development, thank goodness for WOW Toys who know exactly how to ignite out children’s sparks with carefully thought out toys with fantastic concepts, delightful designs and magical features which keep our tots learning through play as they grow, and will leave you wanting to fill your house with WOW Toys forever more! WOW Toys are available to buy online and at independent toy stores nationwide. For more information on stockists see here. To check out their full range see the WOW Toys website here. Recommended retail prices start at £1.99 for figure packs up to £29.99 for truck items. *This post is in collaboration with WOW Toys. All opinions are my own. Play is so important for children I’m always enocuraging and playing with my son on a a daily basis. Completely agree with you re: how important play is. My boys can play for hours, usually not with their toys but with some random stuff that they find around the house such as kitchen roll tubes:) Typical! Please enter me to WIN! I try to play in lots of different ways with my little girl so she learns different things. It’s really important to make learning fun. Please enter me to WIN!! Hi Iris, I’m having some problems getting my email through to you please could you email me on motherhoodtherealdeal AT gmail DOT com? Thanks! I agree play is very important and my little man loves his Wow Toys they are great. This is so true. I’m always playing with my little one, these toys look amazing 2 except my little one is at the stage were he wants silly things like a brush to play with. Life is essentially all based around play with children, this is how we connect with them, how they learn and how they build their essential life skills. I agree with you on the concept of play. iPhones and X-Boxes just aren’t the same. Play helps kids develop so it is very important. Lovely post. It is true, kids really do have a lot of energy and Ronnie Rocket from Wow Toys is the perfect solution. Play is vital to nurturing a child’s development. Children’s imaginations are amazing aren’t they? I wonder what goes on that the cannot communicate. I think grown ups should pay more too.